With the proliferation of digital communication technology, many children will have received a tablet this Christmas. Here’s our guide to the best learning apps for children. Your children won’t even know they’re learning with some of them! Some of these apps are for Android and Apple, or just one. There are equivalents on the other platforms though. In the week up until Christmas, we tried to teach you how to say Merry Chrismas in a variety of languages. As we said at the time, bilingual children often perform better in education. Being bilingual has been proven to help with problem-solving, multitasking and decision-making. When you look to your child’s future, it is also exciting to think about the possibilities that bilingualism brings. They could also be more competitive in the job market. This app is made by children, for children. It offers educational and entertainment videos to inspire young brains. As a well-known brand, children will also be more than happy to use the app without knowing that they are learning by stealth! Mark, our Communications Manager, swears by this puzzle game. It involves connecting coloured dots in one line using all the squares. The early ones are pretty easy, but the more complicated ones involve a lot of problem-solving. There are daily challenges and different shaped grids. It can be a very frustrating app, but nothing satisfying in life ever comes easily! There is a great crossover between crossword puzzles and the 11+ test. Knowing synonyms is very helpful in increasing vocabulary. A crossword puzzle application will help your child expand their lexicon. From all of the learning apps for children, this is probably one of the most relevant to the 11+ examination. It’s really important to be able to complete maths quickly. Quick Maths should help to hone this skill. 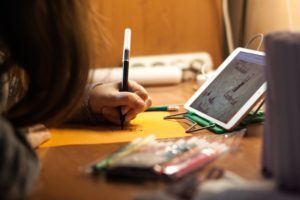 What learning apps for children do you have? These are our ideas. How about yours? 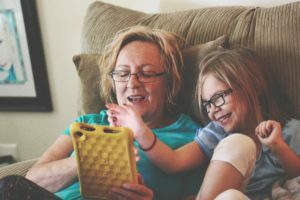 We’d love to hear your thoughts on the apps your children use. And don’t forget, a balance between screen time and other activities away from technology is important. We talked more about it in our blog: Aspirations: How do you strike a balance between a child’s wellbeing and their SATs scores? King Edward VI Handsworth School for Girls – Grammar School GuideHow to be a SMART learning goal setter!